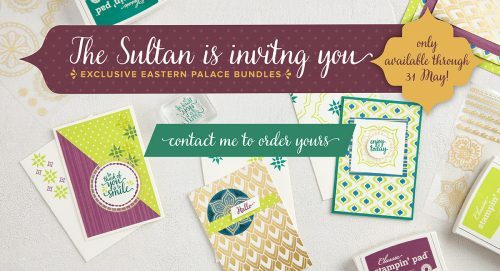 As it’s 1st May, it’s time for me to show you the fabulous limited time Eastern Palace Bundles. 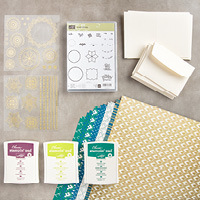 There are two early release bundles available, the Starter Bundle, perfect for the beginner crafter, and the Premier Bundle for the more avid crafter. 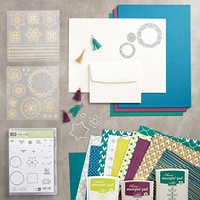 They are packed full of goodies including stamp sets, new In Colors, Designer Series Paper, embellishments and more, plus some FREE items too. These bundles are only available during this month so don’t miss out on these fantastic offers. The items won’t be available again until the new Annual Catalogue goes live in June and won’t be available in these bundle options. Click HERE to find out more details about each bundle. To order one of these limited time bundles, click on the images below to go to my online store. Remember to use the Hostess Code if you are placing an order.